Busy, busy, busy...the weather is beautiful and I have company coming! Today is the day to do some housecleaning, decluttering, and food shopping. I have little bittersweet "droppings" to vacuum up, and lots of dusting to do. The way the light comes through the windows this time of year reveals everything, including the fact that the windows need cleaning! Another day for that...I'm not up to any ladder climbing today. Applebutter is on the "to do" list. Nothing smells better than applebutter cooking. I have a crockpot recipe for it, but today I think I'll use the big Nesco roaster to do the work. So easy...put the prepared apples and spices into the roaster, cover, and let it cook. Yum. I'm going to make a "mock" apple butter soon. The recipe sits waiting for me on the counter. 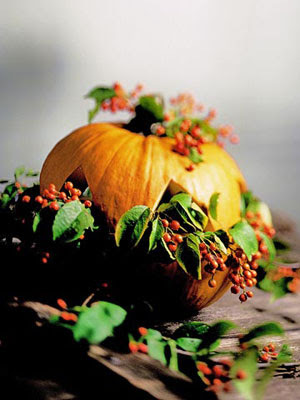 That pumpkin picture is so lovely... I don't get too excited about carved pumpkins, but THAT one is an exception. That sounds so good! My grandmother used to make pear butter with the pears from the tree in her backyard. Teresa-I have not seen the swap package yet. Should I be watching for it? Yum! That would be better than a candle burning any day. THANKS SO MUCH for stopping by my blog! I have been following yours for quite awhile, but I didn't realize you are a fellow Hoosier! How did the apple butter turn out? That sure sounds delish! I love bittersweet! Can there be anything more suitable for fall decor?